Campaign lawn signs are used for political campaigning. In a political announcement, the message should be conveyed properly. If the message is not prominently displayed, it will remain unnoticed by the general public. Thus the sign must convey two thins prominently, 1) the face of the personality should be prominently displayed and 2) the message should have the ability to convince local people. These signs are prominently displayed and they have the ability to reach the mass. The lawn sign confirms extensive visibility for any party personality. Hence, these are heavily used for promotion. 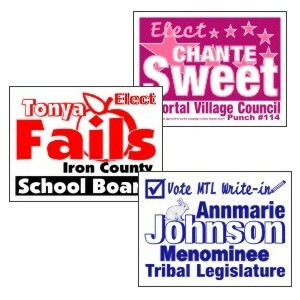 Corrugated plastic lawn sign: these are cheap and best suited for any type of campaigns. These can be perfectly used for conveying the information related to business or product. You may use it for real estate marketing or product promotion during any event or festival. Corrugated plastic signs are durable and light weighted. This material can easily sustain the harshness of weather condition. Thus, it is perfect for any long term promotion campaign. Sealed lawn signs: people mostly use this sign. It is generally available in 16” x 26” size. It is also available in other sizes. These signs are perfect in windy areas. They can easily sustain the thud of the wind. Poly bag signs: these signs are preferred so they appear like large envelopes. They can also be used in any weather condition. These can be perfectly fitted on a “U” shaped stand for prominent visibility. Poster board signs: these boards are not only cheap but can be folded as and when needed. These are easy to carry from one place to another. For effective campaigning follow the below mentioned tips so that your sign does not go unnoticed. Always place the sign on a stand. Fit it properly so that it does not move from wind or rain. Build a v - shaped stand to hold the sign upright in apt position. Place the sign board facing public and road traffic. Apt placement will help in getting prominent visibility of the message. Select plastic signs as they are light and easy to place. Campaign lawn signs are essential part of any campaign. They help you convey the message in an effective way. These are highly used for local promotions. Mention the image, name and information in bold and big sizes so that it is not missed by the target readers. Very well explained about corrugated plastic signs. These sings provide an inexpensive option for high quality, temporary and indoor ad campaigns. As a more effective alternative to flimsy poster board and card stock, corrugated plastic shows off your custom-designed advertisement to its best advantage.